I had a huge deja vu momemt reading this book, as I'm convinced I've read it before, but couldn't find the review so read it anyway as I needed a laugh and adore this series. It was better because I vaguely remembered the story, and knew Nikki wasn't as doomed as she felt. It's unbelievable how much drama goes on for her in amd out of school. She hates letting anyone down, especially Brandon, so ends up pulling out all the stops to care for the puppies. I have to say that a lot of my joy from this series comes from Nikki's little sister. Brienna gets more outrageous in her playing with each book. Her imagination is out of control, she doesn't think about the consequences of her actions at all, so poor Nikki has to try and cover up her mistakes. There's little that can cover up the stench of manure in a bathroom-I don't know if the teddy got clean again!! It was a bit gross as I have a worm phobia so freaked out at that part, but I giggled enough elsewhere to recover from that trauma. The illustrations help make Dork Diaries amazing-I loved how Holly kept covering her nose whenever the puppies got into deep mischief, and it was a sleek intro to Max Crumbly who has has own series The Misadventures of Max Crumbly #1 Locker Hero. Super eager to see what book #11 has in store when Nikki goes on a student exchange to the school where meangirl Mackenzie now attends! 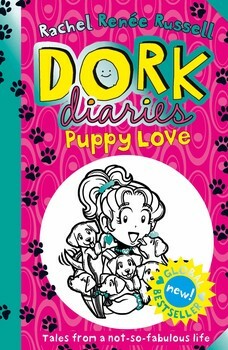 Find out more on the dedicated Dork Diaries website.